This remote control LED beacon increases visibility with 20 ultra-bright LEDs that simulate the rotating look of a police beacon. The Beacon is also equipped with strong magnets that make it easy to attach to vehicles, manufacturing equipment, shop walls, etc. Powered by 6 AA batteries (not included). It also has a standard jack for an optional 110V power adapter (not included). The Super Beacon is rated by the manufacturer for 144 hours on a single set of batteries. In our tests, the beacon operated continuously for 4 weeks, 24/7 on one set of batteries. 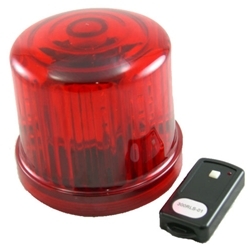 This versatile beacon can be used to warn others of hazardous conditions, increase vehicle visibility or bring attention to any important area or function. The Remote Control feature is a high tech and very practical improvement. This can be summed up in one statement, "You no longer need to pick up the beacon to turn it off or on." Whether your application is on a vehicle, machinery, flag pole or structure; you have control with a pocket sized wireless remote from up to 100' away. Each beacon and remote come in three different frequencies and are frequency sensitive. If you want to operate the frequency three beacon, you must use the frequency three remote. The remote control feature makes these beacons convenient. The frequency sensitivity of the beacons and their accompanying remotes makes them ideal for any situation in which you may need to operate several beacons in an area but want to maintain the ability of individual beacon operation as well. Remote has a range of 100 ft.
Beacon dimensions 4.75" x 4.75"
Beacons are warranted 60 days for manufacturing defects.